Enquiries have been made to various departments in UCC following a confrontation at a Young Fine Gael (YFG) society event involving An Tánaiste, Simon Coveney and two Connolly Youth Movement (CYM) protestors. The incident occurred on October 1st in the West Wing building where the meeting, which was due to be a talk on Brexit, took place. To briefly summarise, when Mr Coveney entered the building he was immediately confronted by two men in the audience, who verbally attacked the Tánaiste directly over his own personal role, along with his party’s contribution to, the housing and homeless crisis. According to sources at the event, it wasn’t the arguments that the two CYM protestors made that offended people, but the way they used bad language and directed personal insults against Mr Coveney. This exact sentiment was held by UCC YFG Chairperson, Danielle Gayson, who said. “Every point that they [the protestors] made was valid. They had their reasons, they had their research, we are more than happy to create an open dialogue with that in the future. 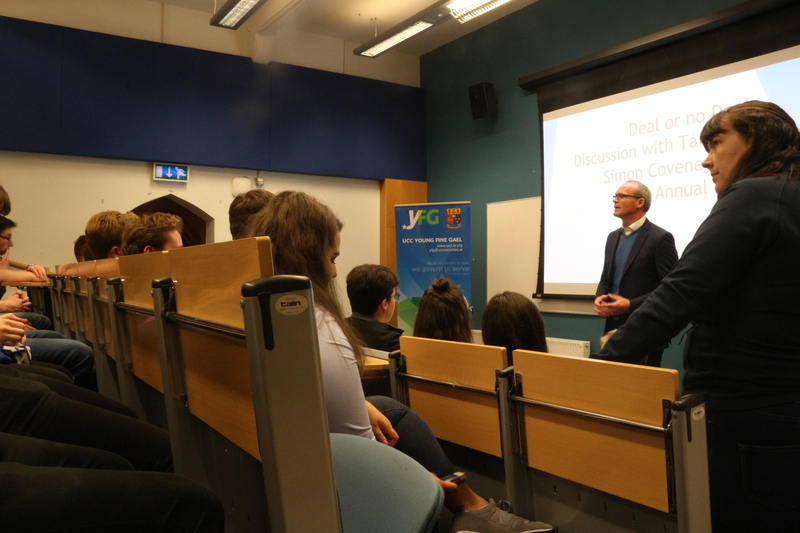 However we [YFG UCC] were disappointed because we felt that there is a time and a place for these things and it took the light away from the Brexit discussion, which was the topic on the night”. While both protestors left of their own accord, it later emerged that two security staff had been called to the West Wing during the incident. Security had been informed that the Tánaiste was on-site before the event, but they were then contacted by a member of the YFG committee as the confrontation ensued. Speaking about the incident and what actions would be taken in the future, Danielle Gayson said, “We don’t want to limit anyone’s freedom of speech in these types of discussions so [in future] we would just try to chair it in a way where there would be respect throughout the debate. We don’t want our guests to feel put out and we feel that they should be able to respond with their own evidence and statistics”. While the YFG Chairperson has clearly taken a magnanimous stance on the incident, questions still remain about future events of this nature. While there perhaps isn’t as much polarisation within Irish society in relation to socio-political issues, we can see that violent protests in the US are at an all-time high. For many people (young people in particular), there has been a sentiment that questions why should someone’s freedom of speech trump someone’s right not to be offended? In response to such a statement, conservative speaker and clinical psychologist, Professor Jordan Peterson, said, “in order to be able to think you have to risk being offensive”. However, such a response has fallen on deaf ears to a particular part of society, who simply do not want to engage in any form of discussion. As a result, we have witnessed some very violent and threatening protests towards speakers such as the aforementioned Peterson, and Ben Shapiro on college campuses, while in the UK, Conservative MP Jacob Rees-Mogg has also faced threatening protestors at a debate. Although here in Ireland we have not reached the same level of reaction, it is not incomprehensible to see it emerging in the future. Therefore, the well-being of students may be called into question, on all sides of the debate. Irish Universities must be prepared for such incidents before it is too late, for the consequences could prove fatal. While this does not suggest that the two CYM protestors previously mentioned were ready for violence, who knows what could have happened had the situation escalated further. While both statements would suggest that UCC is taking the incident seriously, it would seem that current questions raised regarding security are unable to be answered at this time. With further events of this nature plans by both UCC societies and departments, time will tell what lessons UCC have learned in regard to security over the past few weeks.